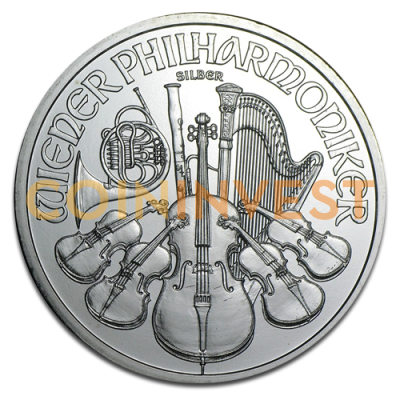 The Silver Vienna Philharmonic coins carry on an eight hundred year tradition of fine Austrian coinage. They are the only widely available European silver bullion coins and the only regularly issued silver bullion coins denominated in Euros. Silver Vienna Philharmonic coins were introduced in 2008, joining their esteemed golden counterparts, and are minted in pure triple-nine silver (a fineness of .999),have a face value of €1.5 and measure 37mm across. For many, the Silver and Gold Vienna Philharmonic coins are the most beautiful bullion coins in the world. Their elegant design celebrates one of Austria's greatest cultural institutions, the Vienna Philharmonic Orchestra. The obverse, or front, of the coins depicts the Great Organ of the Golden Hall of Vienna, a world-famous instrument. The reverse features an assemblage of orchestral instruments, comprised of a string bass surrounded by cellos and violins fronting a bassoon, harp, and Viennese horn. The Vienna Philharmonic Coins succeed brilliantly at honoring the grand musical heritage of Austria.